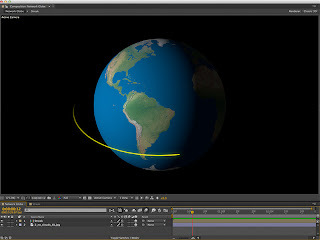 Building networks orbiting the globe in After Effects. More often than I like, I have clients who want a video but don't have much of budget. Basically, it's a step above "Video Services Provided for Free" and unless it's for an established client, I steer clear of these projects as well. In discussions for one such a project, I started thinking of a visual to illustrate one of the messages in the proposed video. Although the project never materialized, I decided to build the visual anyway. This week we'll continue the Dissecting the Video series with a discussion on how to build networks streaking around a globe. This project will be built in Adobe After Effects. The first thing I did was create a 1080p comp that is 3 seconds long. I used 3 seconds so that a complete rotation of the globe wouldn't happen too fast. The earth was created using the image map from Natural Earth III. The image map was imported into After Effects and then placed into the three second comp. The first step of the process is to wrap the image map around a sphere. This is done by applying the CC Sphere effect (under Perspective) to the image map layer. For the image map that I'm using, I change the Radius of the globe to 400. Enable the keyframes for the Rotation Y parameter and set the first keyframe to 0 rotations and the last keyframe to 1 rotation. Make sure the last keyframe is placed after the last frame. 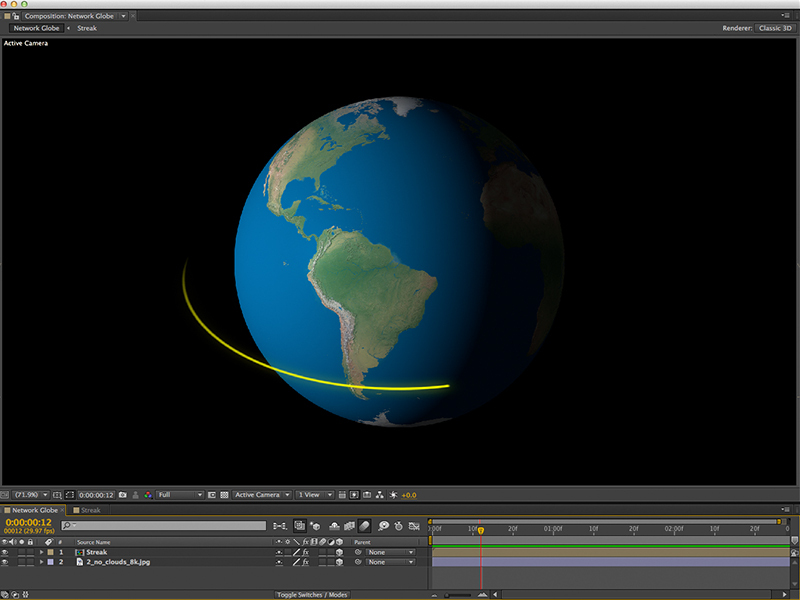 Placing the keyframe after the last frame will make the globe rotation loop properly. For this example, I have left the Light and Shading parameters set to their default states. You can adjust these until the globe looks best to your liking. Once the globe is built, enable it as a 3D layer so that it exists in 3D space. Setting up the globe as a 3D layer will allow your network lines to pass in front and in back of the globe. Parameters of the Vegas Effect. For the streaking network lines, add a New Solid layer and give it a circle Mask with a diameter that is about 1025 pixels - a number that is almost the height of the comp. 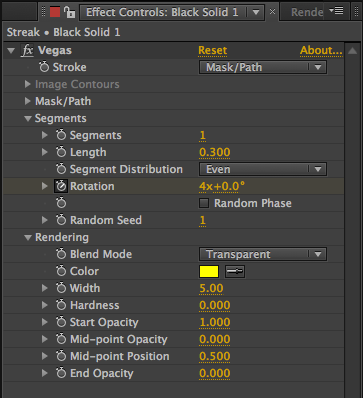 To this layer, add a Vegas effect under the Generate group. Make sure the Stroke parameter is set to Mask/Path, change the number of Segments to 1, the Length parameter to 0.3 (both under the Segments). Change the Blend Mode (under Rendering) to Transparent and the Width to 5. Keyframe the Rotation to 4 rotations at the first frame and 0 rotations at the last frame. Again, like with the rotation of the globe, move the last keyframe so that it is after the last frame of the layer. 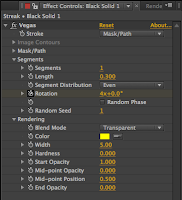 Pre-compose this layer, call it "Streak" and select "Move all attributes into the new composition". 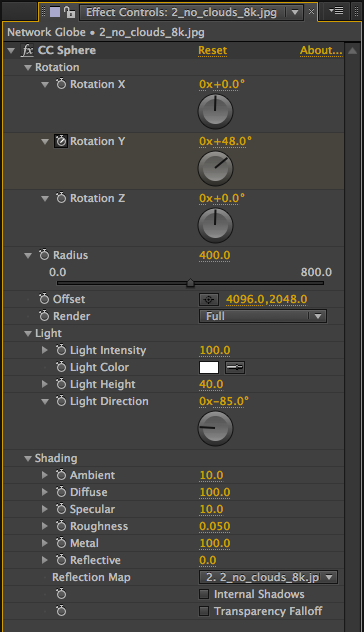 Enable the Streak as a 3D layer and change the X Rotation to -60 degrees. I've added a Glow effect from the Stylize group to give the Streak a little more body. Once you have the Streak layer looking the way you like, duplicate it and adjust the Rotation of the new layers until you have your preferred number of Streaks orbiting the globe. This exercise is to give readers a general understanding of the basic concepts. The hope is that these concepts can be adapted for use in more complex compositions. A downloadable copy of the Adobe After Effects project and need source can be found by following this link - After Effects Networks Project. Below is what the final video will look like. I'm glad it was helpful.